The story of how the first Harley-Davidson Knucklehead stroker motor was built reminds me of those old Reese’s Peanut Butter Cup commercials from the 80’s. Random events would always cause a chocolate bar to land in a jar of peanut butter, resulting in an unexpected and delicious flavor combination. Just like the commercials, random events brought together all the parts to build the first Knucklehead stroker motor and it only took the right person to see how they all went together. In case your not sure what a "stroker" motor is, let me get you up to speed. When you are building a “high performance” Harley-Davidson engine, or any engine for that matter, there are two standard methods for increasing displacement and in turn increasing horsepower and torque. The first is to bore out the cylinders and fit larger pistons. This approach is commonly used to convert an 883 Sportster into a 1200 Sportster and produces good results at a relatively low cost. For those that really want to hot rod their engine and are willing to invest a bit more time and money, lengthening the stroke is a second option for adding more displacement. “Stroking” an engine is a much more extensive modification requiring complete disassembly of the cases and the installation of different flywheels and connecting rods. That may seem like a lot of trouble to go through, but there are some key advantages to stroking vs boring. The longer stroke increases leverage on the pistons which results in more torque. Also, a stroked motor will typically produce more horsepower than an engine of the same displacement with a larger bore. So if you converted your 74” motor to an 80” motor by stroking, you would have more horsepower than if you bored your 74” cylinders to reach the same 80”displacement. That all sounds pretty good, but with any performance modification there are always some downsides. The extra stroke length means that your piston has to travel a longer distance when moving up and down inside the cylinder. This distance has to be covered in the same amount of time as in a stock engine, so your piston speed goes up as does the amount of wear and tear on your engine. The increased piston speed can also be problematic if you want to run at high RPMs for sustained periods. This can lead to catastrophic engine failures when the piston reaches a velocity at which it can no longer maintain its structural integrity. Still the stroker motor has proved to be a viable powerplant and for applications like street riding and drag racing, it has been a popular modification since the first stroker motor was built in the late 1940’s. 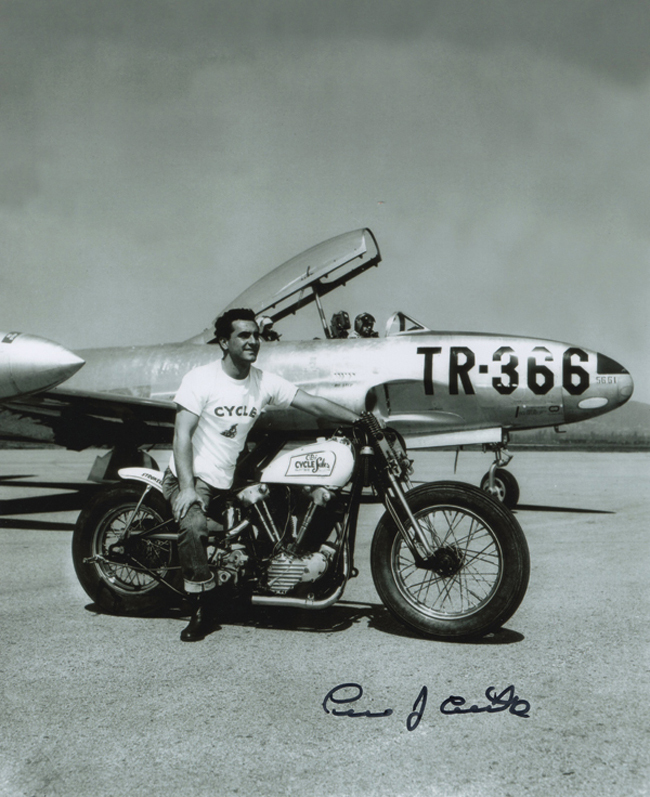 According to a first-hand account from Gil Armas, who helped build the motor, it all came together one afternoon in his shop. Gil was tearing down the 80” engine from his Big Twin Flathead when his buddy C.B. Clausen happened to stop by. While Gil was taking apart the Flathead, C.B. was on the other side of the shop looking at Gil’s Knucklehead engine which was laying in pieces on the bench. After eyeing the parts for a while, C.B. went over to Gil and picked up the flywheels from the Flathead engine. A quick check with a ruler confirmed that they would fit inside the Knucklehead cases, so C.B. started putting the Knucklehead back together using the larger Flathead components. Everything was going fine until he fitted the engine with 61” cylinders. 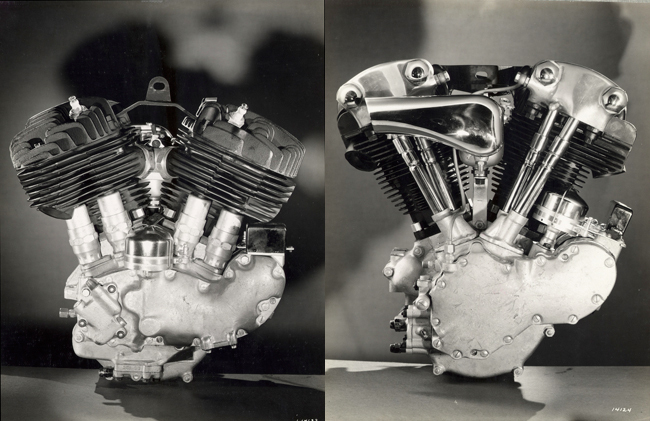 The increased stroke of the Flathead flywheels caused the pistons to stick out past the top of the cylinders. Unphased, C.B. grabbed a set of 74” cylinders and everything lined up perfectly. The piston skirts had to be modified slightly to clear the flywheels and with that the stroker motor was born. Looking back, this seems like it would be pretty obvious to most motor builders, but you have to keep in mind that the Flathead and Knucklehead engines are two very different motors. Flatheads use a side valve configuration which houses the valves inside the cylinder casting, beside and parallel with the piston. The Knucklehead uses overhead valves mounted in the cylinder head, just like most modern motorcycles. These large differences must have been what kept others from attempting this parts swap. Now here is where the story really gets interesting, fast forward a few years to the early 1950’s. C.B. 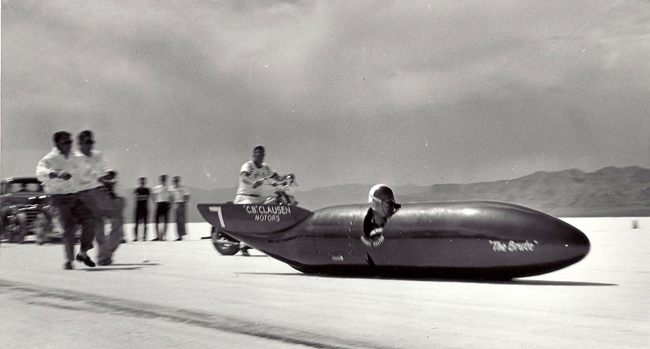 Clausen and his stroker motor had been making a name for themselves on the drag strip and the salt flats. C.B. nicknamed the machine “The Brute” and pilot Louis Castro raced it in a variety of configurations including a full streamliner. 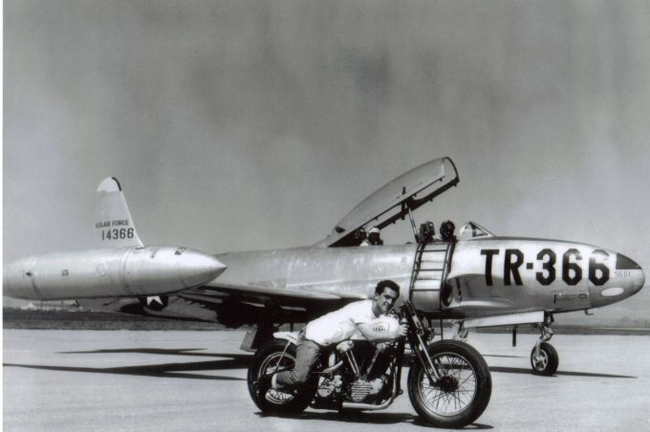 Cycle Magazine got wind of this machine and decided it would be a great promotional stunt to drag race The Brute against a US Air Force Lockheed T-33 jet. The race was held in Los Angeles, CA on April 12, 1952. Taxiing across the runway, the jet was able to complete a ¼ mile run in 11 seconds. The Brute made the same pass, but beat the jet, running the ¼ mile in 9.4 seconds and reaching a speed of 132.81 MPH. Not to be outdone, the Air Force brought out a P-51 Mustang. This time the plane was airborne, but The Brute was able to beat the Mustang by 4 plane lengths on a ½ mile course.